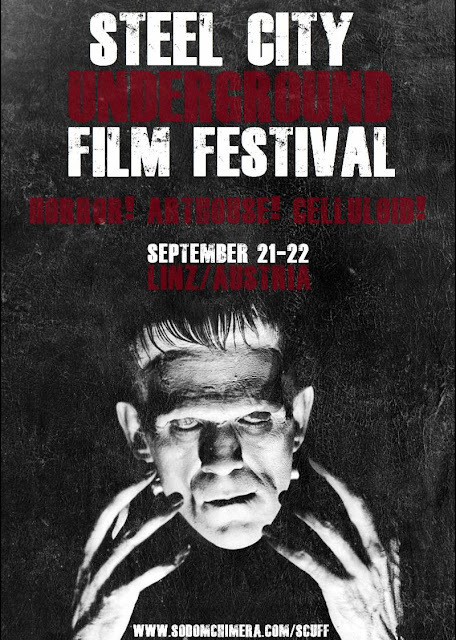 Sodom & Chimera Productions, known for their experimental features and short films, is inviting likeminded filmmakers to Europe this September with the inception of the Steel City Underground Film Festival (SCUFF). A celebration of horror, arthouse, experimental and weird cinema, SCUFF is curated and hosted by Sodom & Chimera's founder James Quinn (Flesh of the Void, Sulphur for Leviathan). "The mission of SCUFF is not only to bring independent, international horror, arthouse and experimental films to an Austrian audience, but also to revive a screening format that is, unfortunately, fading from theaters and venues, which is 16mm film. The goal here is not only to give the viewers a unique experience, but to give filmmakers the chance to screen their film in a way they might otherwise never get the chance to, on film. Driven by passion, we want to give horror fans the chance to see some of the most infamous classics on beautiful prints. We stand for horror, independent filmmaking, and the revival of celluloid." In addition to the official selections, SCUFF will host screenings of 16mm prints of iconic horror and experimental milestones such as Nosferatu (1922, with live music), Frankenstein (1931), Tod Browning's Freaks (1932), A Trip to the Moon (1902) and Un Chien Andalou (1929). Each of the classics will be preceded by a selected short.